Here we will prove that in any quadrilateral the sum of the four sides exceeds the sum of the diagonals. 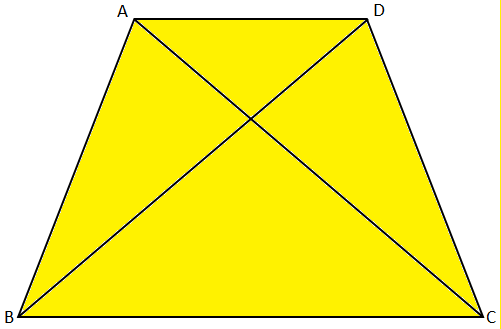 Given: ABCD is a quadrilateral; AC and BD are its diagonals. To prove: (AB + BC + CD + DA) > (AC + BD). 1. In ∆ADB, (DA + AB) > BD. 1. Sum of the two sides of a triangle is greater than the third side. 2. In ∆ABC, (AB + BC) > AC. 3. In ∆BCD, (BC + CD) > BD. 4. In ∆CDA, (CD + DA) > AC. 5. 2(AB + BC + CD + DA) > 2(AC + BD). 5. Adding the equations in statements 1, 2, 3 and 4. 6. Cancelling the common factor 2.